2006 June — I See Hawks in L.A.
Anchoring a corner in one of Sunset Boulevard’s less tony strip malls, Safari Sam’s already feels like a cool drink at the well to this transplanted Appalachian hillbilly. Indeed, pull down the mezzanine (but leave the wreckage), and this spacious box-with-stage looks like a twice-scale model of the Wagon Wheel, a long-defunct West Virginia country-cooze honky-tonk from whose bar I lifted my first illegal beer. Here last Saturday (June 24), by the twos and threes, crept in the elderly hippies, the part-time rednecks, the Inland diaspora, tattooed girls in tight print dresses, hipsters-with-ears, and aligned buckaroos of all ages, both genders, and every ethnicity – yeah, the whole Hee Haw gang – for L.A.’s greatest practitioners of the high-lonesome tonal art, I See Hawks in L.A. and Dave Alvin and the Guilty Men. Looking about me at this friendly, flirty assemblage, I could see a Red State glowing in every heart. When last I checked on ironists I See Hawks, they were pursuing a nice line in astringent, cannabinoid C&W, with but the merest hint of the cozmik choogle they throw down now. Their third album, California Country, can be filed alongside The Notorious Byrd Brothers and Burrito Deluxe as evocation of the acidhead West; a land of purple trees and hard times, of loss, predation, circling helicopters, and second-generation hippie chix shaking their asses. These Riders of the Purple Booj make honky-tonk sweetness out of this welter of good and bad and worse, with Angeleno THC meditativeness standing in for the beery familiarity of Buck Owens, Merle Haggard, and the Bakersfield sound. Sophisticates may sneer (with or without surgery’s aid) and Westsiders squirm, but, like everything beautiful, such numbers as “Motorcycle Mama” and “Houston Romance” provide their own justification. There’s something of Haggard’s whimsical toughness in Rob Waller’s voice, and the songs evince some of Randy Newman’s knack for gone-dead Goya caricature. The eternal Huck Finn penchant for the wistful (“Raised by Hippies”), the tall-tale fantastic (“Slash from Guns N’ Roses”), and the fatalistic (“Jackpot!”) are stylishly indulged on disc, but they’re thrown down like a rock ‘n’ roll barn dance live. Patrons sweated and gripped each other as room temperature rose and outer garments peeled away. It’s late June, the longest day of the year has passed, and the Hawks are laying low. We’ve played almost every night, Phoenix to Richmond in 21 days, and didn’t escape 100 degree + weather till the last week of the tour, but then the humidity stepped in. We’re lounging with the wives and families, resting up for Tour round II. The Hawks reunite on Saturday night in the Southland, our maiden voyage at the brand new Safari Sam’s in East Hollywood, and we’re curious. West on Los Feliz, south on Western, oops, east on Sunset, just past the mega-99 Cent store and into the parking lot, park at the giant Tiki face and load in. Safari’s Sam’s just might be the best club in L.A. It’s big but not too big, dark with many dark corners, funky but with good sound and lights. Steve Zepeda is a long time booker and a musician’s friend (not to be confused with the Guitar Center magazine, which local wit Doten has rechristened “Musician’s Acquaintance”). He knows how to treat bands and thus has a great lineup on the calendar.We’re opening for Dave Alvin, who has kindly requested us, and his gear is set up, soundchecked, and ready to go. We do our humble opening band tribute to a sound check and head for the beers, hanging with Drac in the back, as the public pours in. The sun is still setting. Ah, summer. If time on the road teaches you anything, it is to ignore hideous onstage sound and keep playing. Don’t whine, don’t grimace, even if the monitor is feeding you ear splitting midrange sludge. Which greeted our first song, but we plowed through, and the packed house was perhaps none the wiser. Soundman got it together, and we got a great reception from the roots rock audience, packed with vets of L.A.’s first golden age of clubbery, the late 70s/early 80s when X, The Blasters, Plugs, Los Lobos, and many semi-forgotten but great bands played Wongs east and West, the Hong Kong, Cathay de Grande, Blackies. Young people went to Flip and Aardvark and bought thrift store suits and jackets and 50’s dresses and packed the clubs. If hippiedom was dead, this wasn’t such a bad alternative. And these folks are still rocking, with an infusion of youngsters in the crowd. Rick Shea (whose name means “hawklike” in Irish) added his soulful pedal steel and then guitar to the Hawks set. It gets hot in Safari Sam’s, hot and dark like Austin or Memphis, and that’s a good thing. A great L.A. welcome home. Dave Alvin and his mature Guilty Men hit the stage and played with fire. It’s Dave’s record release party for his brand new West of the West album. The crowd was borderline worshipful for such a hardnosed bunch, and Dave’s lead guitar was stinging and on the money. The Hawks mingled with old and new friends. A shoutout to our publicist Susan Clary, in attendance with her artiste husband Hudson Marquez, the guy who buried the Cadillacs in the middle of the Texas prairie and called it Cadillac Ranch. In America money buys you not only justice, but press coverage, and Susan has been kind enough to help us out at her Second Tier Country Rock rate, because she loves music and odes to altered consciousness.More greetings inside and out Sam’s, to the Coles family (rumor has it Coles is no more more! Alas! Alas! ), Jeff from Santa Barbara, Chris Morris, Randall and his rocker mom Evelyn (“I know this sounds ridiculous, but have you seen my mom?”), as Dave and Men cranked out the hits of bygone California, including the best of the night, Dave’s own “Fourth of July.” Get yourself a copy before the weekend. After staying out way too late, next morning Hawks Paul, Paul, and Rob gathered at a coffee house at Wilshire and Hauser, greeted by Chris Morris, pillar of L.A. rock criticism, who’s also the salvation of Indie 103.1’s Watusi Rodeo, taking over the show with wit, encyclopedic knowledge, taste*, and enthusiasm. Chris escorted us upstairs and led us through a charged up interview, despite having half the sleep we got (last night he taxiied over to Cinema Bar to catch Randy Weeks and get his dose of Tony Gilkyson guitar–FYI, it’s a $40 dollar ride). We played “Raised By Hippies,” “Grapevine,” and something else and were told it sounded great. We’re still waking up from that one. It’s almost 4th of July, and then we hit the road again. *Overfunded westside “public” radio station DJs, take note. You might judge I See Hawks in L.A. by the company they keep. Rick Shea, Dave Alvin’s guitarist for the past half decade, sits in with the group as often as his schedule permits. Fiddler Brantley Kearns, another regular in Alvin’s band who played for years with Dwight Yoakam, is essentially a fifth member of the band. Chris Hillman adds mandolin to three tracks on I See Hawks’ latest disc, California Country, its title betraying the band’s debt to Hillman’s trailblazing work with the Byrds and the Flying Burrito Brothers. Shea says the Hawks lie somewhere on along the California musical continuum “from Sweethearts of the Rodeo to Captain Beefheart.” The three-part harmonies between guitarist Rob Waller, multi-instumentalist Paul Lacques and bassist Paul Marshall have become a distinctive element of their sound. Drummer Shawn Nourse, who’d previously played with Yoakam and James Intveld, rounds out the lineup. With many Los Angeles country-scene players having communal ties to I See Hawks, the shuffling “who’s available” lineup lends a supple “how will it sound tonight?” flexibility to their shows. On their 2004 album Grapevine, “Humboldt” received a traditional big-beat Burrito-esque country-rock treatment, but a website live version sounds like a psychedelic electric bluegrass raga band playing after-hours at the Grateful Dead house. Shea calls frontman Waller “an amazing singer — strange, sad, poetic, crazed, controversial. And any lyric, when he sings it, makes perfect sense, like you’re sitting around getting high talking to a good friend.” Waller, a creative writing instructor at USC, and Lacques, a successful playwright and comic strip creator, began to write together in Lacques’ Echo Park apartment in 1999. They issued their self-titled debut disc in 2001, with Kearns contributing fiddle. Their songs are rife with mournful social commentary, environmental tragedy, wily humor, outsider guile, and political undercurrent. The title track of California Country elaborates on the eerie late-night cover photo of a lonely gas pump island along some Golden State commuter alley. The angst at the loss of California’s natural beauty to population and progress sends a message that is simultaneously spiritually uplifting and politically bitter. Elsewhere, on the gently sarcastic “Hard Times (Are Here Again)”, Waller wryly bemoans, “There’s no ink in my printer/ It’ll be a long, long winter,” while the hilarious and surreal “Slash from Guns N’ Roses” drops a bunker buster bomb on Hollywood pretension. 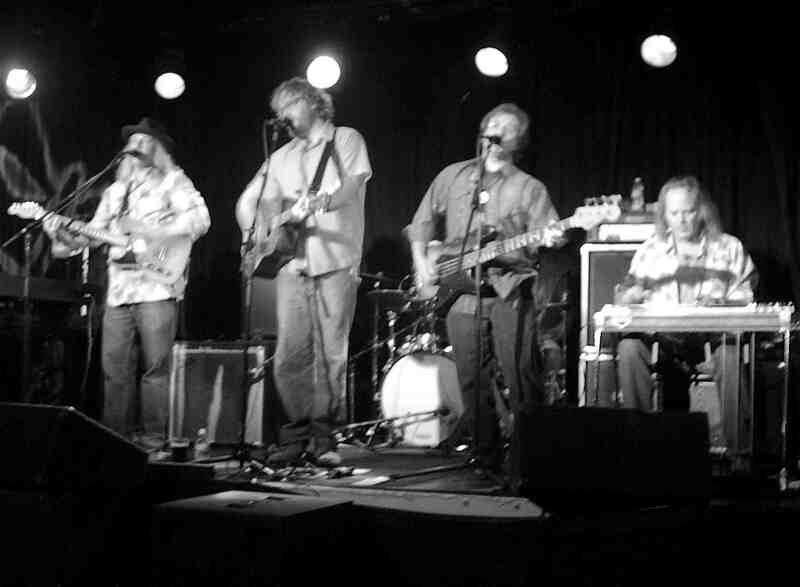 RALEIGH — One of the genuinely interesting country bands on the scene nowadays is I See Hawks in L.A. The group is on the road in support of their latest album, “California Country,” and they’ll be making a stop at Raleigh’s Pour House Sunday evening. I See Hawks is, as the title of their new album suggests, a California-based group. They’ve released three albums, with their self-titled debut disc coming in 2001. Each album has raised the ante in terms of what we might expect from this band. The mentality behind their vibe is expansive and still developing. I See Hawks’ second record, “Grapevine,” was one of the best albums of 2004. The mood of the disc was somber, even cerebral, and the sound was a beautifully resonant evocation of California country music, albeit spun to suit the I See Hawks personality. “California Country,” on the other hand, is long on wit and shrewd observation. The sound is often described by music critics as “cosmic country,” which is a reasonably coherent allusion to I See Hawks predecessors such as The Byrds, The Flying Burrito Brothers, and Gram Parsons. Waller said he finds Sen. Robert Byrd of West Virginia a complex and inspiring figure. “In the lead-up to the Iraq war, he was the one guy who really got up there and not only spoke against the whole idea — and did so eloquently — but also reminded Americans of our values and what the Constitution means, and the danger of going out on this foreign military adventure,” Waller said. “And nobody listened to him. “California Country” also features a very dramatic, amusing song about Guns N’ Roses guitarist Slash. The song envisions a Hollywood party at which the real Slash confronts the fake Slash. “California Country” is a different album, conceptually, from “Grapevine.” It asks us once again to revise what we think we know about I See Hawks. “Our pursuit is to get more imaginative,” Waller said of the new recording. “The songs that we’re working on for our fourth record show that our vision is getting even more clear. I mean, we’re not at a loss in terms of where we want to go musically. Whether or not people will come with us, I have no idea,” he laughed. I See Hawks in L.A. is definitely a band in an interesting creative situation. Their music is often evocative of the other California — the Buck Owens-Roy Clark California beyond the frantic glitz of L.A. On the other hand, they’re very much a part of what’s up in Los Angeles today. It’s a best-of-both-worlds scenario that’s generating outstanding music.